If you’re a fan of tapping up Instagram or Pinterest for interiors inspiration, you’ll probably have noticed the influx of houseplants on your feed. From minimal spaces peppered with potted cacti, to bohemian pads strewn with hanging shrubs, the trend for bringing greenery indoors doesn’t seem to be going anywhere fast with millennials, and the Royal Horticultural Society says we have wellness to blame for our expensive potted plant habit. 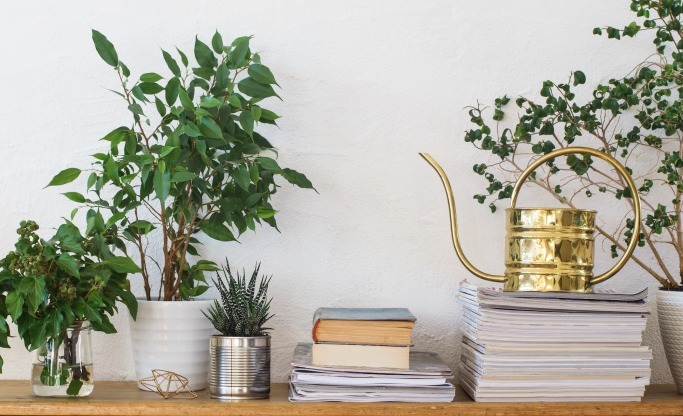 According to the RHS, indoor plants have become increasingly popular with a renting generation that can’t afford their own gardens, so have turned to houseplants as a way to bring the calming effects of the great outdoors into their homes. This fragrant plant is a member of the olive family and is typically found outdoors, but it can also thrive in a home environment – if it gets plenty of sunlight. The white flowers on this delicate shrub are where you’ll really get the wellness benefits; they give off a calming scent that’s not only pleasant to have suffused in the air, but researchers at the Wheeling Jesuit University have also found that it can help you to get a better night’s sleep. How to look after it: During the spring and summer months, jasmine needs full sunlight, while in the winter months it still needs light, but it doesn’t have to be direct. Soil should be moist and well-drained, but take care not to over-water. If you’re feeling stressed, lavender is a great plant to have dotted around your home. This tolerant shrub is known for its bright purple flowers and famously floral fragrance that promotes calm and relaxation. A study by the Miami Miller School of Medicine found the scent of lavender in bath oil calmed babies and sent them off into a deeper sleep, while also reducing stress in the mother. Lavender is a great plant to have in your bedroom, but if you’ve got it naturally growing in your garden, you can harvest the flower buds and put them in a bowl next to your pillow for the same effect. How to look after it: Lavender likes warmth and sunlight, so place it on a sunny windowsill and water sparingly. Aloe vera might just be one of the hardest working houseplants going. Not only is the sticky gel found inside the aloe vera plant great for applying to insect bites and sunburn, it naturally cleanses the air as it grows in its pot. During the late 1980s, NASA began studying houseplants as a means of providing purer and cleaner air for space stations. It found that aloe helps clear the air of formaldehyde and benzene, which can be a byproduct of chemical-based cleaners and paints. How to look after it: Succulents like aloe vera do best in dry conditions, so make sure the soil has completely dried out before its next watering. They also prefer to be placed in sunny places like windowsills. This unusual-looking plant has spear-shaped leaves that grow upwards, with distinctive yellow borders. Not only does a snake plant add an interesting talking point to any room, it’s also good for air quality too. One of the top air purifying plants identified by NASA’s clean air study, it removes at least 107 known air pollutants, including carbon monoxide and nitrogen monoxide. Snake plants also produce lots amounts of oxygen throughout the night, making it an excellent plant to keep in your bedroom. How to look after it: Snake plants are very low maintenance and will thrive in just about any amount of lighting. They prefer dry soil and should be watered once every two to three weeks. The peace lily is a forest green plant with elegant white flowers that as well as looking good, does good too. NASA has ranked it as one of its top-rated plant cleansers, effectively removing all common indoor pollutants generated by furniture, electronics and cleaning products. They’re soothing to look at too. How to look after it: Peace Lilies need little light and watering just once a week. High humidity areas are preferred, so it’s a great one to pop on top of your bathroom cabinet.